10 Questions: Do You Need Marketing Automation? A couple of weeks ago our firm prepared a detailed ROI analysis for a client helping them substantiate to their management the investment in a marketing automation platform. In this particular instance, the numbers were relatively clear-cut. Fortunately, and to the client’s credit, they had firm metrics for each stage through which a raw inquiry ultimately converted to a sale. Using even the most conservative assumptions, we were able to project a return – in the form of increased revenue – that far outweighed the price of the software under consideration, even allowing for related services and staff time. For other companies, the decision of whether or not to take the plunge into marketing automation is less of a slam-dunk. Not everyone is able to measure the precise ratios at which sales leads currently convert to sales. Or even if the processes with which those leads are shepherded along the sales cycle are woefully inadequate, a company may not generate the volume of inquiries necessary in order for marketing automation to make a difference. And lastly, to be frank, it depends how bad you are. In other words, a company whose lead management, database marketing, and sales follow-up are all horrific beyond words has much more to gain from marketing automation than a competitor who follows best practices dutifully, even if they don’t have the machinery in place to automate the process. Inevitably, much of the business case for a marketing automation solution comes down to intangibles. Where in the current sales and marketing process will the software make a difference? If you can show that marketing automation, coupled with a formal, defined lead management strategy founded on best practices, will have a measurable impact in a dozen different ways, that alone may be enough to sway the powers-that-be. How do you know where marketing automation will help? Below are 10 questions to help analyze your current processes and identify opportunities for ROI. 1. How efficiently do raw sales inquiries convert into qualified prospects? 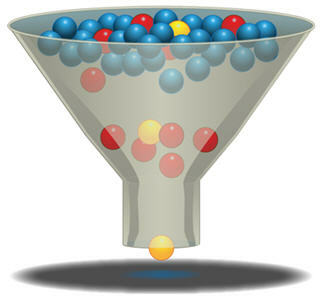 Do sales leads routinely enter the funnel only to die a lonely death in the CRM database? 2. How easily is the inside sales team able to identify a qualified lead, or even one that meets basic demographic criteria? What percentage of sales time is spent pursuing, and engaging with, prospects that ultimately aren’t worth the time? 3. Do you offer free trials or evaluations? At what rate do those free trials convert to paying customers? What processes are in place – either automated or through sales follow-up – to ensure a trial implementation is successful? 4. How much information does a sales rep have about a qualified lead? Does he/she know more than basic demographics? What about areas of interest, stated or implied (for example, by virtue of visits to specific pages on your Website)? How would your close ratio be impacted if reps knew more about the people they were calling? 5. How diligently are leads followed up with? How long before the average lead receives a phone call from a sales rep? How many calls does a rep make before he/she achieves a live conversation? Before he/she gives up? What percentage of inquiries never hear from a rep? 6. How easy is it for reps to glean the names of decision-makers at companies responding to your marketing campaigns? Is the job function of a typical sales lead at a level capable of advancing the sales process? 7. How much do sales leads know about your company, your product, your category when they first engage with your company? How much education is needed before a lead becomes a viable prospect? 8. How effectively do you harvest additional business from existing customers? At what rate do existing customers renew maintenance agreements, buy add-on products, refer their colleagues in different departments? 9. What is your current customer churn rate? What percentage of lost or dormant accounts eventually return to do business with your company? What processes or initiatives are in place to maximize that opportunity? 10. What percentage of total opportunities come from existing prospects? From new leads? Does most of your business come from leads generated in the last 30 days? 3 months? 12 months? How reasonable is it to expect that a prospect in your CRM database would contact your company if he/she had a relevant need tomorrow? What would you add to this list? What is the area of improvement that ultimately enabled you to win approval for marketing automation? Add your suggestions in the comments below. This entry was posted in B2B Marketing, Database Marketing, Lead Management, Lead Nurturing, Marketing Automation and tagged b2b demand generation, b2b lead generation, B2B Marketing, Lead Management, Lead Nurturing, Marketing Automation on May 6, 2010 by Howard Sewell.